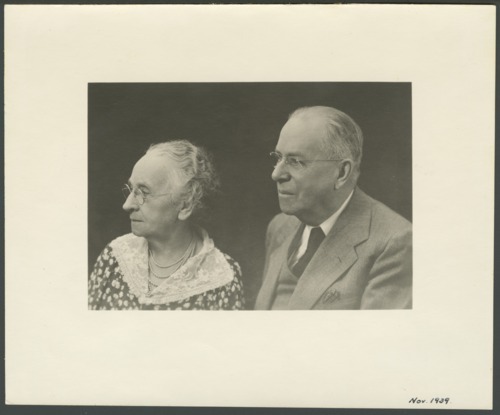 This portrait shows Dr. Charles Frederick Menninger and his wife Flo V. Menninger in 1939. They had been married for 54 years. Dr. C.F. Menninger and his sons, Dr. Karl and Dr. Will, formed a group psychiatry practice in 1919. The Menninger Clinic as a sanitarium was established in 1925 with the purchase of a farm house and admittance of 12 patients. The philosophy was that mental illness could be treated with an integrated medical, psychodynamic, and developmental approach for the total health of patients. Flo Menninger started the Menninger Bible Study series which is still in use.